Open LFB: Basket and the City "Tous Addicts"
Open LFB 2009: "Tous Addicts"
For the fifth season the Open LFB, better known as Basket and the City, marks the start of the new season in France of the Ligue Féminine de Basket. As in previous seasons the first round of games will be played in Paris at the "Stade de Pierre de Coubertin" (Pierre de Coubertin arena). 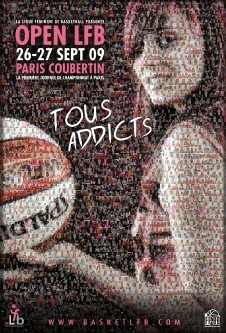 A simple poster this year, with a collection of pictures sent in by the general public embedded in the background, displays a young woman with a basketball and the slogan "Tous Addicts", should incite more basketball fans to visit the Open LFB 2009. Television and radio crews from various regions will be on hand to broadcast the event around France. All the games will be streamed live by LFB-TV with commentary in French. This season Alain Jardel (head coach of France U20 Women), Jean-Pierre Siutat, (former president of the Ligue Féminine de Basket), the recently retired and double champion of Europe Cathy Melain, and France U16 women coach Arnaud Gupillotte will assist the commentary team. Yann Kappes who used to be the voice of women’s basketball from the commentary box is no longer with the LFB but Julien Guerineau, Ivano Ballarini and Didier Servant will be around to cover all the matches. Only 4 coaches from the 14 on display have participated in the previous four Opens: Pierre Vincent with Bourges Basket, Cyril Sicsic with COB Calais, Valéry Demory with Mourenx and Montpellier and finally Abou N’Diaye with Aix-en-Provence and Villeneuve d’Ascq. The format of the two-day event has not changed with four games on Saturday and the remaining three games on Sunday. In addition to basketball, there will be the presentation of awards for the 2009 LFB trainer of the year as well as the trainers involved in youth basketball. It was a good summer for the French Women international teams with gold medals for the senior women at EuroBasket 2009 and U20 European Championship Women Division A. In addition there were silver and bronze medals for the U18 and U16 also at the European Championship Women Division A. 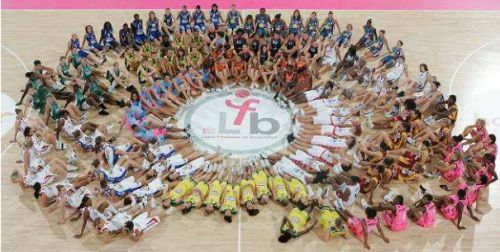 Players from all these teams will be presented to the crowd during the two days at the LFB Open.